It’s vital to keep your pool fence properly maintained and check it regularly to ensure proper pool fence safety. Why? Because having a pool fence as a safety barrier to your pool can help to prevent drownings. 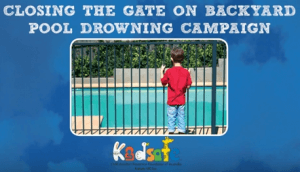 Statistics from the Royal Life Saving National Drowning Report show that in 2014/15, 26 Australian children aged 0-4 years drowned – an increase of 30% from 2013/14. Evidence suggests that a large number of drowning deaths in pools are as a result of fencing that is faulty or non-compliant with Australian Standards. How do I check my pool fence is safe? Life Saving Victoria provide an online tool that will help you to assess the safety of your pool. Their home pool safety guide offers both a printable checklist and an online assessment. This is an awesome safety checklist. It will step you through each component of you pool fence from nearby climable objects, to gaps in panels (and below), to the gate and latch and even the pool area itself and pool chemicals. As a pool owner you should do this safety check of your pool every year. Pool Fencing News, Pool Safety, Pools. permalink. Swimming Pool Insurance – Do you need pool insurance?